I am not a voracious reader of baseball books. I do read them from time-to-time, but I tend to gravitate towards books on politics, current events or American history. One baseball book that I highly recommend is Intangibles: Big League Stories and Strategies for Winning the Mental Game—in Baseball and in Life. The author is my friend, Geoff Miller (thewinningmindinbaseball.com), a Mental Skills Coach with the Atlanta Braves (I also wrote the Foreword for the book, but that’s beside the point.) My point is every once in a while a “must read” baseball book comes along, and this is one of them. People who know me think that I love numbers. The reality is that I love understanding how things work and I love decision processes. Numbers, if selected thoughtfully, just happen to be an outstanding vehicle to explain how things work and to improve decision processes for big league clubs. Understanding and appreciating the mental aspects of baseball is the perfect complement to a player’s stats or a scout’s ratings of a player’s tools. Anyone who is passionate about the game of baseball, or is connected to it in some way, wants to understand the mind of the ballplayer. What makes him tick? How does he marshal his talents during a high pressure moment to perform? How does he prepare for an upcoming encounter with his opponent? These are the types of questions discussed in Intangibles—from the vantage point of an expert teacher and the athletes and coaches he’s encountered. Many of Geoff’s stories stem from his experiences with the Pittsburgh Pirates, one of his former employers. He has a rare and unique ability to grasp the bigger picture from his various coaching experiences, and it comes through in his writing. One of my favorite sections of the book is a discussion of a “Baseball IQ.” Miller discusses ways in which a pitcher can learn to read a hitter’s reactions to a first-pitch fastball. He discusses the six possible hitter reactions, their meaning and even some insights as to the optimal pitch sequence—all based on careful observation of the hitter’s reaction to one pitch. From the hitter’s perspective, it’s not good enough to know what a pitcher is expected to throw in a given situation. He also benefits by knowing the why. The why gives the hitter insight into the mind of the pitcher—his motivations, level of confidence, fears and insecurities, and the pitcher’s personal assessment of his own strengths and weaknesses. By knowing the why, a hitter acquires a certain intellectual intimacy with the pitcher, which may provide a competitive edge and raise his probability of success. The Baseball IQ section also includes several multiple choice tests that can be used to assess a player’s depth of understanding of the game and also serve as a tool build his or her knowledge of various game situations. Beyond the relevance to baseball, the book is a personal training guide for the mind and can give each one of us—whether or not we are in the baseball world—tools and insights to be a better version of ourselves. Check it out. If you love baseball, you’ll really enjoy Intangibles. Relying on my statistical models I’ve developed of pricing in the free agent market, which Melky is eligible to enter this fall, I’ve translated his recent success into a future earnings estimate. My model includes a player’s past performance, age, position, durability, and several other factors. In the past, the model has been a reasonably accurate predictor of how “the market” values players (which should not be confused with their real “value” to teams.) Even if Melky’s torrid pace were to have slowed a bit and he finished this season as a 6 WAR player, I estimate his valuation in the upcoming free agent market would have been approximately $15 million per year for four years—a $60 million contract. To those who have not adjusted to Melky’s new level of performance, this may seem like an outrageously generous contract. But remember, last year he turned in a 4.2 WAR year, with a .809 OPS, a significant improvement over his early career performance. Also, keep in mind he would have emerged onto the free agent market with his “star” status as a 28-year old, which means a 4-year deal would take him only through his age 31 season, prior to when we would expect his significant age-based decline. What about his earnings beyond his next contract? Let’s assume his performance declines over the life of this hypothetical 4-year agreement (while MLB salaries rise) and conservatively estimate that he would earn an additional $10 million over the final phase of his career, which would begin in 2017, at his age 32 season. Let’s call it $70 million in future career earnings, had his performance not been tainted with his drug policy violation. The more difficult task is to assess the career path for Cabrera had he chosen not to engage in PEDs. The complicating factor is his 2011 year in Kansas City, which was the first indication that he would deviate from his “old” career trajectory. In the middle of 2011, Cabrera had a major power surge. The difference between his first half and second half slugging percentage is 98 points (.423 to .521) and his OPS increased by 154 points (.735 to .889). In our scenario, let’s not give Melky the “benefit of the doubt” and instead toss out his 2011 season as partially corrupted. Let’s assume that the real, non-synthetic Melky Cabrera is the pre-2011 player—an assumption some baseball executives may make when they evaluate his free agency in the off season. For perspective, Melky’s career from 2006 through 2010 averaged 0.6 WAR per year—the rough equivalent of Willie Bloomquist. While it’s difficult to pin down a solid estimate of Melky’s earnings for the balance of his career had he not made his step up in performance in 2011 and 2012, I’ll peg it at an average of $2 million per year for the next five years—a total of $10 million. 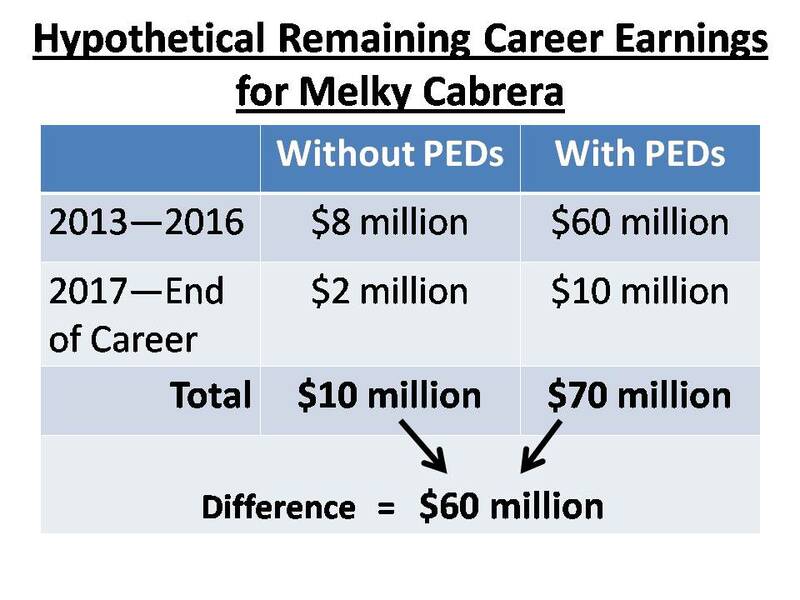 Using these estimates of Melky’s earnings with and without PEDs, the difference is about $60 million ($70 million minus $10 million.) Now here’s the troubling part of this issue: The only thing Melky put “at risk” (in addition to his reputation) is a portion of this year’s $6 million salary, should he get caught. His 50 game suspension, as a first-time offender, means Melky has put up a $1.8 million “security deposit” to assure that he plays by the rules. If he gets caught, he loses $1.8 million of prorated salary. If he doesn’t get caught, he gets his security deposit back and makes an additional $60 million in career earnings. This means that even if Melky had a 96% chance of getting caught, he had so much to gain and so little to lose (financially), that it would be an economically rational choice to take PEDs. Perhaps, the Melky Cabrera situation is a “perfect storm” of unusual circumstances. First, if all of his performance increase (over his 2010 baseline) is attributable to PED usage, then the impact of the drugs on a player’s performance is likely more dramatic than anyone might have anticipated. We tend to think of “star” becomes “elite” player (Alex Rodriguez) with PED usage, or AAA player becomes major leaguer. In the case of Cabrera, we’re saying that he morphed from the 24th guy on the roster to a perennial All-Star, which may be an exaggeration in our assumptions. Second, and related to the first point is Melky seems to be atypical in terms of the massive amount of money he stood to gain, while having so little to lose, financially. The combination of being in the final year of arbitration, while on the verge of free agency at such a young age, all contribute to the “much to gain, little to lose” situation. However, if PEDs are capable of altering a player’s performance by as much as Melky Cabrera’s improvement, then the penalties for violation of MLB’s PED policy are likely too lenient. This leads me to consider potential enhancements to the PED program for the next Collective Bargaining Agreement that would both raise the penalty for violating the policy and lower the gains from not getting caught. The penalty for a first offender should be increased to serve as a true deterrent. Perhaps a player should have 80% of his annual salary at stake, rather than the 31% represented by a 50-game suspension. If Melky stood to lose nearly $5 million of his income if he were to get caught, he may have been far less inclined to take the risk. On the matter of lowering the potential financial gain from improved performance, there are several directions to consider. One approach is to have a more aggressive testing protocol for players in the “walk year” of their contract—those who have the most to gain financially from illegally enhancing their performance. Since their potential financial gain is much greater than a player already working under a multi-year contract, perhaps increasing their motivation to cheat, shouldn’t their penalties also be higher? Another potential solution to the walk year issue may be to force a violator to forfeit a year of free agency. In other words, any player who violates the PED policy while in his walk year (or for that matter during their arbitration years), remains arbitration eligible for one extra year, thereby delaying his free agency by one year. While the current PED policy is a huge step in the right direction of cleaning up the game, it seems like it’s built for a system where steroids have a only modest impact on player performance and it places too much reliance on the moral conscience of the player, rather than aligning the financial incentives for compliance. In other words, MLB is implicitly banking on players wanting to “play fair” or to place a high value on their reputation as the primary means of discouragement from violating the policy. It will be interesting to see how PED usage and penalties evolve over the next several years. Building off of Part 1 and Part 2 on the relationship between winning and revenues, I’ll share highlights of my Revenue Opportunity Index—an analysis I began at the end of last season to get a better sense of the which teams could expect the greatest financial gain by improving on-field performance for the 2012 season. I initially used this to gauge who might be the most active players in the free agent market, but modified it to give an indication of the opportunity for revenue upside for this season. The index combines “raw” revenue opportunity with the expected competitiveness of the team. Raw revenue opportunity—an analysis of a team’s unrealized and potential revenues—includes a team’s ticket revenue upside, based on the current (previous season’s) attendance, ballpark capacity and average ticket prices. If a team’s average ticket price is far below the MLB average, they are deemed to have more ticket pricing upside than teams like say, the Yankees, Cubs, and Red Sox, whose prices are already far above the league average. The combination of empty seats and ticket pricing upside determine the potential for attendance revenue growth. I combine this with overall market size and an estimate of “brand strength”, which is intended to get at a club’s likelihood of realizing the attendance upside. Next, I give points for the attraction of a new stadium (Marlins). It’s been shown that the synergy of a competitive team and a new ballpark can accelerate revenues. Finally, I factor in a team’s recent postseason history—both their success in the postseason and the time since their last appearance. A recent deep run through the playoffs suggests a portion of the revenue opportunity has already been realized. Onto this raw revenue opportunity I overlay a team’s anticipated competitiveness. This speaks directly to the point I’ve made in the past (in Diamond Dollars and elsewhere) that certain ranges of wins have a greater financial value. If a team was expected to be hovering in the 85 to 93 win category in the NL, they were assigned a higher Competitiveness index than say the Astros, a team that was not expected to be competitive and therefore not in a position to truly capitalize on their raw revenue opportunity. A competitive team provides motivation to fans to reach into their wallets to generate revenue for the ballclub. The Revenue Opportunity Index combines the raw revenue upside with a team’s expected competitiveness. Entering the 2012 season, my Index ranked the following teams in the top quartile: the Dodgers, Angels, Braves, Blue Jays, Rangers, Marlins and White Sox. The Dodgers topped the list, having been beaten down in the latter stages of the McCourt years via declining attendance. They represented a large market, lots of unused seating capacity and reasonable ticket prices, not to mention a great brand. Combine these raw revenue factors with a team that was expected to contend in the NL West and the stars were aligned for the Dodgers to drive revenue growth for 2012, under a new revitalized ownership group. A team that is conspicuously absent from my list that was generated prior to the season is the Washington Nationals. I expected the Nats to be at least the 3rd best team in the NL East, but underestimated their division leading pace. After escalating the Nats performance expectations, I ran an alternate scenario through my model and the Nats easily came out in the top quartile of revenue growth for 2012. On the other hand, Toronto is a team I mistakenly expected to contend for a wild card spot in the always tough AL East. Given their half-full Rogers Centre, there is tremendous revenue upside, once the Jays truly challenge for the postseason. The Rangers have tantalized their fans with near-championships in back-to-back seasons and are realizing the value of their playoff success, with nearly a 20% increase in attendance over last year, on top of an 18% attendance increase in 2011. On the other hand, there are instances of attendance declines in the face of improvements in team performance. Sometimes the layout of the schedule can have a measurable impact on a team’s attendance. One might think the way the schedule falls over the summer and which interleague teams are coming to town has a minor impact, but I’ve seen schedules that have generated a 5% or 10% swing in attendance, independent of team performance. For example, if a team in a cold weather, northern climate (without a dome) has the Yankees and Red Sox come to town in April, rather than weekends in July and August, it can mean six or seven games with 20,000 less fans in the stands. The number of home games in various months can also have an impact. Northern cities dread April and early May games, when fewer fans are willing to brave the elements to attend. On the other hand, the Arizona Diamondbacks thrive on April games, while snowbirds are still in town, but dread July and August games when the local population base shrinks. Two other relevant points to add about the impact of winning on revenues: First, the fans response to winning is not instantaneous, as I discussed in an earlier post. In the past, when I’ve modeled annual attendance as a function of on-field performance, I found that a combination of the most recent season and the previous season had the greatest explanatory power. Second, excess capacity is not always a positive factor for realizing revenue growth. After talking with hundreds of fans in focus groups and surveying thousands of others in quantitative surveys, it’s clear that an abundance of empty seats reduces the urgency of fans to make an advance purchase, or to buy season tickets. Their perception is “good seats will always be available.” Anything that allows fans to wait to purchase tickets, usually has a negative effect on ultimate attendance, as some fans who had good intentions to buy tickets on game day find that often “life gets in the way”, or an unfavorable weather forecast causes a change in plans. Also, another penalty of a near-empty ballpark is that it detracts from the atmosphere and excitement of attending a ballgame, for both the attendee and the television viewer, discouraging future ticket sales. Statistical modeling can provide insights to the ebbs and flows of team attendance, but the analysis is most effective when it includes a framework that incorporates consumer behavior. 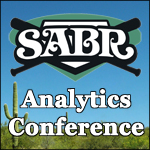 Just like the best explanatory models or forecasts of player performance must include factors that are not on the stat sheet, the same is true for attendance and revenues, or for that matter, any behavior models. I’ve spent a lot to time analyzing the financial payoff from winning, including the role the postseason plays, but have not written much about it since Diamond Dollars. Arecent update of my analysis confirms many of my original conclusions. There is strong evidence the biggest financial payoff from winning comes from reaching the postseason, not just having a competitive 85 or 90-win season. Improving win totals can add to revenues, but only marginally when compared to the financial gains from the playoffs. A postseason berth carries a huge psychological halo for fans, particularly under the old (1995-2011) playoff structure where there was little differentiation between the division winner and the wild card. Beyond fans basking in the hope of a 1-in-8 chance at a Championship, October baseball initiates a series of events that typically give the revenue engine a jump start, particularly for teams that have not been to the playoffs for several years or more. It begins with fans scrambling for October playoff tickets, only to be disappointed by the seat choices available or the prices in the secondary ticket market. Full of their new found optimism about their ballclub, they often make the decision to become a partial- or full-season ticket holder for the following season. Since season ticket holders typically get the first crack at postseason tickets, fans view it as an “option” on future playoff seats. When enough fans hold this mindset, it can significantly move the needle on a team’s season ticket base. The magnitude of the increase in the season tickets is driven by several factors, including the size of the current season ticket base and the available seating capacity of the stadium. The amount of time since the last postseason appearance and the frequency of being in the postseason in the last four or five years, also impacts the financial return. For the Yankees, the postseason is built into fan expectations and is a critical factor for season ticket retention, but after 14 appearances in 15 years, does little to increase their total. Another major factor dictating the size of the financial payoff is a team’s playoff success. The 2005 Padres won the NL West with a modest 82-80 record, slipping into the playoffs only to go three-and-out to the 100-win Cardinals in the division series. The combination of an unimpressive win total and complete failure in the postseason doused cold water on any fan hopes and left the Padres with virtually no postseason payoff. Conversely, that same year the White Sox won their first World Series since Pants Rowland was their manager, 88 years earlier, and nearly doubled their season ticket base. Perhaps the best news about increases in the season ticket base is its “stickiness”. Fans typically don’t cancel their season tickets if the team fails to fulfill on the imagined promise of a forthcoming dynasty. Following their Championship season with a 90-win (no postseason) and a 72-win season certainly cost the White Sox some season ticket renewals, but they still retained many of the their new-found subscribers who jumped on board after the 2005 season, as it can take up to five years of postseason abstinence to completely dissolve the financial benefits of a deep run of October baseball. Let’s look at the revenue math, using a conservative example. If a team generates 4,000 new season tickets from a postseason appearance at an average price of $35 per ticket, it represents $11.3 million in revenue over 81 home games. But that’s just for the first year following the postseason appearance. If we assume the team plays 80- to 85-win baseball over the next 5 years, but fails to reach the playoffs, we can expect the attrition rate to be about 20% per year. That means the total gross ticket revenue from a postseason appearance would reach about $34 million—three times our first year total. Some teams might experience less of a bump in season tickets, while some would likely expect more. If a team performs poorly in the years following their playoff appearance, they could experience a steeper falloff in their new found customers, so this is just an illustration of the potential magnitude of the impact. The revenue from new found season ticket commitments are just one means of monetizing October baseball. Next year’s advance ticket sales of single game tickets see a boost. Ticket price increases for playoff teams (in the year following their playoff appearance) are about double the increases for non-playoff teams. Luxury suite demand surges, as companies acknowledge the greater value a postseason team provides for entertaining customers or rewarding employees. Companies tend to jockey to increase their financial commitment as corporate sponsors of a playoff team, because of the prestige and fan affinity from being on board. Broadcast ratings rise, some of which the team may be able to monetize, based on their broadcast arrangement and contracts. Finally, the playoff games themselves can generate some additional revenue, although the players’ pension fund is entitled to a portion of game revenues. When you combine all of these incremental revenues (and in some cases deduct the portion a team may need to pay into the revenue sharing pool) a team can generate from $25 million to say, $70 million, over a 5-year period, from reaching the playoffs just one time. This means the highest value wins—those which carry the greatest financial gain—are the wins which increase the probability of reaching the postseason. Historically, in the National League a team that improved from 86 wins to 91 wins, increased their probability of qualifying for the postseason from 23% to 80%. In other words, the most valuable wins to a NL club were typically wins 87 through 91, which increased a team’s playoff chances by 57 percentage points. I call this steepest portion of the win-curve the “sweet spot”—the range where wins have the highest value. (In the American League, because the two super-powers—NYY and BOS—typically upped the ante for the wild card, the highest leverage wins tended to be wins 90 through 94.) Using $20 to $70 million range as our incremental revenues from the postseason, you can see how much value a team places on improving its on-field performance. The five wins referenced above can be worth from $3 million to $8 million each, just due to the allure of the postseason (57% x the postseason dollar opportunity). Add another $1 to $2 million for each win for simply moving up the win-curve, independent of the postseason opportunity and you end up with about a $4 to $9 million value per win. Contrast this with the financial rewards of improving from say 73 to 78 wins, which may be worth only $1 million each in revenue, since the postseason is not in play. Quantifying this postseason effect, helps us see why teams shop in the pricey free agent market to add the “last piece of the puzzle”. For a team at or near the sweet spot on the win-curve, even a hefty free agent signing can make financial sense. In my next post, I’ll discuss some new findings and wrinkles to this framework, including why it breaks down for a club like the Tampa Bay Rays, as well as how the new wild card format impacts the win-curve. The amateur draft has been around since 1965, when the Oakland Athletics drafted Rick Monday as the first overall pick. The draft debuted before free agency, so its initial purpose was simple: funnel exclusive negotiating rights for the best amateur talent to the worst performing teams to prevent the Yankees and other teams that had significant resources, from grabbing all the talented young amateurs. Once free agency emerged and player salaries began to escalate, the draft served an additional purpose—it provided a source of low cost talent to teams during the six years of control. Teams could draft and develop talent and benefit from their services for 2 or 3 years at a price near the major league minimum salary, followed by the player’s arbitration years at some level of discount to their free agent market value. But as free agency grew and players’ salaries escalated the draft morphed. Instead of delivering the top talent to teams with the worst record, it favored teams that allowed players to leave via free agency, through compensation picks. If we take a close look at the draft slots of teams at opposite ends of the MLB food chain—the Pirates and Royals (low revenue/poor performing teams) versus the Red Sox (high revenue/high performing team)—we may be surprised at what we learn. Over the last decade, the Pirates and Royals averaged about 68 and 67 wins per year, respectively, placing them among the worst performing teams in MLB. As one might expect, the Pirates and Royals 1st pick each year came early in the June amateur draft (averaging #6 and #5, respectively). 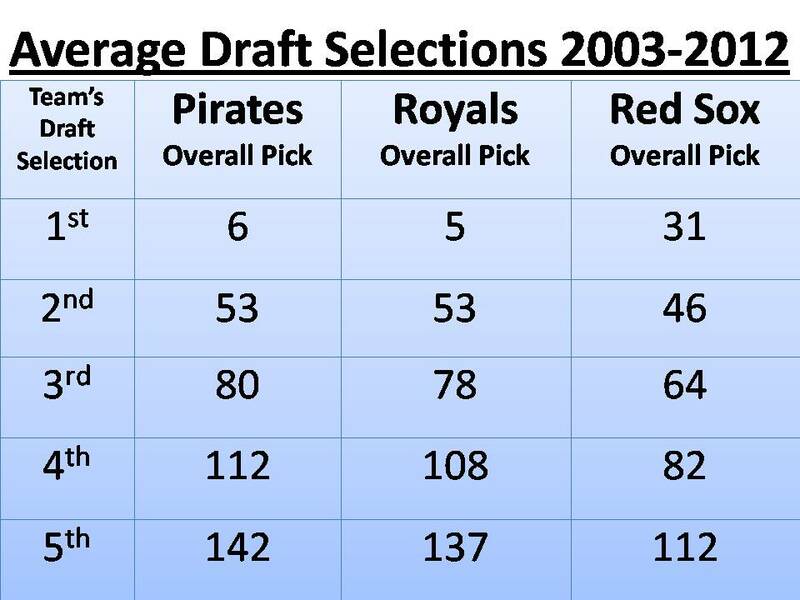 But because of the glut of compensation picks that infiltrated the draft, the Pirates and Royals did not pick again until the 53rd overall pick in the draft, on average. The first 5 picks for the Pirates averaged #6, 53, 80, 112, and 142. The Royals top 5 choices averaged #5, 53, 78, 108, and 137. These teams shared two common characteristics over the last decade—they had consistently poor records and they did not engage in the free agent market for high-priced/high-quality players that would earn draft pick compensation, once they departed. Conversely, the Boston Red Sox averaged 93 wins over the last decade and frequently shopped in the free agent and trade markets for Type A free agents, allowing many of them to walk after their contracts ended. Not surprisingly the Red Sox 1st pick in the annual draft averaged to be the 31st overall pick—resulting from a combination of the best/near-best win-loss record and forfeiting some first round picks due to signing free agents. However, after their first pick the patterns of draft selections gets interesting. The Red Sox second through fifth pick in the amateur draft was (on average) better than that of the Pirates or Royals. After choosing #31, the average Red Sox selections were #46, 64, 82, and 112. In each instance, picks two through five were better than those of the downtrodden Pirates and Royals. (See table below) In fact, over the last ten years, the Red Sox had a top 100 draft selection 41 times—meaning they averaged 4.1 per year from the top 100 overall picks. The Pirates had 31 (3.1 average) and the Royals had 33 (3.3), over the same 10-year period. Simply put, the draft pecking order had devolved into a reward mechanism for teams losing their free agents, rather than being driven by a team’s prior year performance. The new CBA better aligns on-field performance with draft order and restores the draft to its original purpose—a tool to improve competitive balance across the league, and even goes one step further. First, it nearly eliminates compensation picks. These compensation picks served to delay the second round, pushing the picks of the lowest performing teams deeper into the draft. (On average, the second round of the draft began at pick #51, over the last ten years.) Secondly, the new CBA adds Competitive Balance Lottery picks—picks allocated to teams with either low revenues or a low winning percentage. There are 12 Competitive Balance picks in total—6 following the first round and 6 slotted in after the second round. The Royals currently have the 3rd worst record in baseball. Should they finish the season in that position, they are likely to have picks #3, 31, 39 and 75 in the 2013 draft, while the Red Sox current status will likely leave them with #14, 50 and 86. Could the new CBA have gone further? Absolutely. It stopped short of reordering all draft picks based on a team’s revenues. Such a redesign might have allowed small market teams to sustain their competitiveness for a longer window of time by allowing them to infuse elite amateur talent into their organization, even while they are competitive. Another positive aspect of the new draft rules is allowing for trading of competitive balance picks, although only during certain time windows, not to include the winter meetings. Draft picks are the rights to acquire amateur talent—and are assets with a tangible value. Giving teams the right to assign these assets as part of player transactions is one more small step towards a more efficient trade market for players. Overall, the draft implications of the new CBA are clearly a big step in the right direction, perhaps paving the way for even greater reform in 2017.